Free evaluation prior to first day or overnight stay. No Processing Fees or Application Fees. Complimentary full day of day camp! To be used in month purchased. Package good for 1 year from date of purchase. Dog must be from the same household. Package good for 1 year from date of purchase. Available on Interview Day. Package good for 1 year from date of purchase. Available on Interview Day. Dogs must be from the same household. Package good for 1 year from date of purchase. For a low monthly subscription, your pup gets unlimited Day Camp fun. Plus receive $20.00 off your first month. 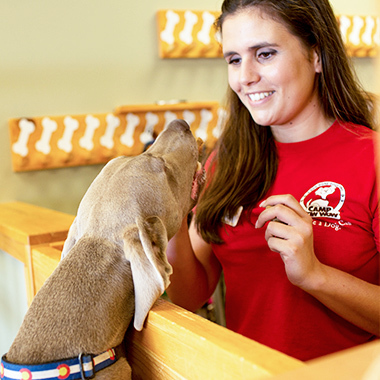 For a low monthly subscription, your pup gets unlimited Day Camp fun. Plus receive $20.00 off your first month. Dogs must be from the same household. 15 minutes of one-on-one time with a Camp Counselor for extra belly rubs and head scratches. Specialized, personal attention for your pup, while you're pup is at play. You pick the service and the number of sessions per day and we take care of the rest. Price is charged per session. 15 minutes of one-on-one time with a Camp Counselor to play Camper's favorite game (i.e. fetch, tug, etc.). Specialized, personal attention for your pup, while you're pup is at play. You pick the service and the number of sessions per day and we take care of the rest. Price is charged per session.